As spring has finally chased off winter, the lake water is finally heating up in the fishing world and the publishing world as well. After a winter of great publicity through ESPN (twice–see Glen’s Bassography and Jerry McKinnis’s article), Tulsa World, BassFan.com, NPR, and the Shiloh Museum we’re looking to make the rounds in the Ozarks for book signings. Shane and Glen love entertaining, so it sure to be an enjoyable time for young and old. We’ve also uploaded some new videos featuring Glen’s storytelling to our Facebook page that were previously only available on YouTube, so check them out too. In order to bring in the new season, we’ve pulled a new story and a few pictures out of the archives that should put you all right in the boat with Glen to experience the World Champion for yourselves. Of course you can find many more stories in the book– An Impossible Cast–which you can buy at the Whitefish Press. We hope you all enjoy! Some time ago, Glen, Shane, and I put the boat in down at Tucker Hollow on Bull Shoals. Around 7:30 that morning, Glen came knocking with coffee, chattering excitedly about the day. 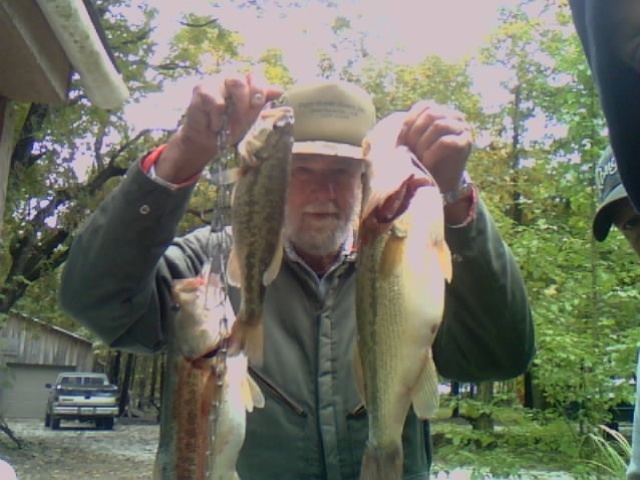 Rain had bloated the lake and muddied the water—good conditions for catching bass he said. Our destination was Bear Creek near Glen’s parents’ old farm. He’d fished it constantly growing up before it was inundated, but he hadn’t returned in years. His only concern was the forecasted 5 to 17 mile-per-hour north wind, which he was certain would kill our chances because he’d rarely caught bass with a north wind. That morning’s trip was sparked by one week earlier when Wayne, an old friend from Rogers, Arkansas, drove across the state with a nice boat and bassin’ fever. The day he arrived Glen and Shane took him out on the lake. Shane caught his largest bass ever, a 5.5 pound Largemouth, and Glen wasn’t too embarrassed with a 4 pounder. They were both embarrassed though that Wayne got skunked. The next day, Wayne joined the fun as they found a hungry school of Kentuckies near the West Sugarloaf Creek Bridge. When they called me to come down, Glen had promised that the Kentuckies would still be schoolin’. His mission was to put me into a mess of them and watch them tear my snuff-box reel to shreds. Once on the lake, Glen thought we could find lunkers bunched up around the old, submerged Lowry Bridge. He was confident he could locate the bridge despite our lack of electronics because as a child he’d spent summer Sundays just up the creek near the Lowry grist mill and mill pond. After church, families would walk down the hill and picnic at the pond. Children pruned their skin soaking in the water and diving from boulders. Glen’s memory was accurate. We found the bridge and Shane caught a 3 pound Largemouth on a crank bait. Apparently, though, that fish was a loner because we spent most of our time clearing lake trash from the bottom with our spoons. We weren’t in a hurry though, so the boat drifted with the north wind along a wooded bluff that extended 50 feet into the water from the shore. Glen decided that he would try for some white bass using one of his homemade spinner baits, which he put on his spinning reel with 6 pound test line. After fumbling with them for five minutes, he threw them to the bottom of the boat in disgust. The wind was making his eyes water so that he couldn’t see the line. Shane put on his glasses and eventually tied the lure on. Throughout Glen’s story, his lure was proving him a liar until the north wind pushed us to the mouth of a creek clogged with washed out branches and trees. “Uh, oh!” Glen warned. “I got one. Aww, but he’s just small one. Ohhh . . . wait a minute! Wait a minute, he’s growing! He’s grown up! Oh my gosh, it’s big ‘un! Boy he’s really fightin’ now. 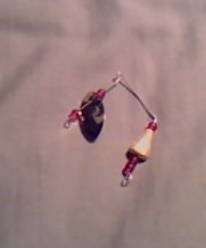 How am I gonna get him in the boat with this little 6 pound line?” Glen guided the Largemouth to the front of the boat. He reached down trying to manage both the rod and the bass, “Oh my gosh, I’ve got him! He’s nearly 5 pounds!” He threw the monster in bottom of the boat. “Ha! My squirrel-hair worked!” He looked at his contraption proudly. But that would be the last of the squirrel hair. As we headed back down the creek, he’d caught some trash on his spinner bait, jerked the rod to remove the trash, and watched as the squirrel-hair arm of the lure broke off and disappeared into the murky water! Glen blamed the north wind.